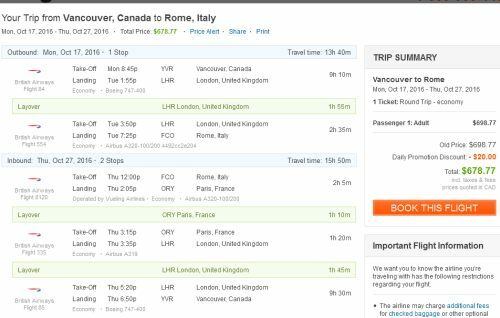 Similar to the Barcelona deal yesterday, British Airways has now dropped the price on a few of their flights from Vancouver to Rome, Italy down to $677-$709 CAD roundtrip including taxes. mid April to mid May 2016 and mid October to early November 2016. 2. 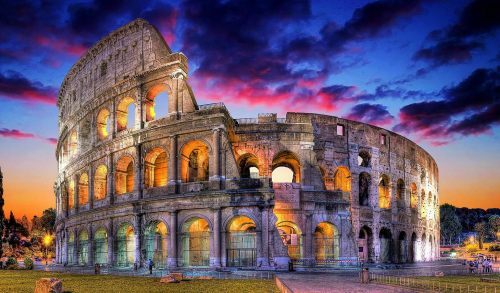 Search for a flight from Vancouver to Rome, Italy (FCO). - The first search result on FlightHub is not always your best flight option. Sometimes the best / fastest flight is way down the page. Look for flights that are still in the $600s and low $700s, but with a travel duration of 15-18 hours. In some cases, a 1-stop flight may only be $3 more than a 2-stop flight! IMPORTANT: Some of these flights may involve transferring yourself from London Heathrow to London Gatwick during the 5.5 hour layover on the way there. You also need to collect your luggage at Heathrow and take it with you to Gatwick. The map below will show you some great deals on AirBNB accommodations in an ideal location in Rome for under $99 CAD/night for 2 people. vancouver, yvr, flight deals, europe, western europe, southern europe, italy, rome, fco and british airways.